Summer is here, even though the days are still cloudy/rainy here in Seoul! This is the season where everyone is battling sticky sweaty skin, where our pores are oozing with makeup that melts into gunk and ickyness. For those of us fortunate enough to be let in on the secret, there are treatments that can keep your skin fresh, smooth, and radiant despite all the evil forces (mainly heat) battling our struggle towards perfect skin during the hot summer. This July our promotion will be a package treatment that can help reduce enlarged pores - including a whopping FIVE treatments total. Arneb is an excellent face lifting equipment for fine wrinkles, pore contraction, tone and elasticity improvement, and acne treatment. By adding the pneumatic system to the existing high-frequency diode laser compound method, the Arneb laser keeps energy from unnecessarily moving and instead concentrates in on the exact target, reducing side effects and increasing treatment effects. Multi-Xel is a fractional laser that makes artificial wounds to trigger the skin's natural response to heal and regenerate collagen. It's an effective treatment for acne scars, wide pores, anti-aging, and improving general skin tone. Patients may experience redness and microcrusting for up to about a week - during which you should apply plenty of moisturizer, avoid sauna/hot baths/alcohol, and protect yourself from the sun. 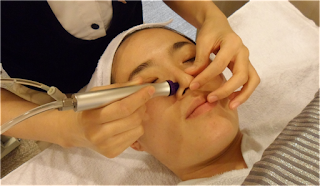 AquaPeel is a hydrating and exfoliating facial that uses a vacuum-like hand piece and 3 different treatment solutions to dissolve and remove the impurities and excess oil on your face. It is an adequate facial for acne patients as well, which cleanses and brightens up your skin. Click here for more info. Velvet Mask is a 100% collagen mask that traps moisture within the skin and has soothing, cooling, whitening and skin rejuvenating properties. Though the results are not permanent, the one session can leave your face considerably brighter and refreshed! 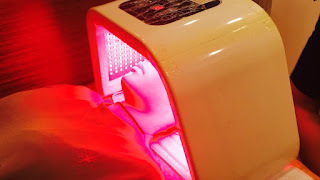 Omega LED light therapy has soothing and calming effects after laser treatments. It can be used to treat inflammatory acne/skin, breakouts, and prevent any irritations or swelling. What a great way to finish off a package treatment like this one!